Great website! I have a Senecio pendulans purchased at a small nursery about 6 months ago. There were three plants in a 4” pot, one of them was several segments long. 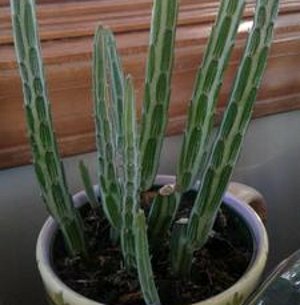 I’m in Texas and keep the plant on a windowsill that gets bright light all day including late afternoon sun. It was doing great until a couple of months ago. One by one the rooted segments rotted. I didn’t water it very much so I’m not sure what happened. My question is how to root the trailing segments. Two methods didn’t work for me: 1) wrap in moist paper towels, and 2) putting the end directly in soil. Currently, I have them laying on top of the soil. Most of them are shriveling, not a root in sight. One of them has a small bud but hasn’t grown any in the last few weeks. I pushed the soil up close to the bud and give it a very small amount of DI water every other day to keep that one spot under the bud moist. I set up a grow light for my other succulents. I keep the Senecio in the general vicinity but not too close to the heat. I read somewhere that Senecio pendulans likes to grow in winter. Any ideas on what I’m doing wrong? I don't know this plant by this name ( - it looks very similar to a plant I've seen called Senecio stapeliformis) but any plant that is under stress will have a hard time rooting. There is a ton of evidence that succulents really dislike water around their roots, and this sounds like what happened to the original plant, even though you don't think you watered much, it may have been too often. Let them dry out, as in, bone dry, between waterings. In this kind of case, the rot may just continue to travel up the stem. Watch for that. Wrapping the stem with a wet paper towel may work for some plants, but not succulents. So what you're doing now sounds right - as long as you don't water it! This is where it usually goes wrong. So keept dry. Give it at least a couple of weaks - don't keep pulling it up to see if it's rooted yet either. Complete benign neglect is what the horticulturist orders. Be patient - it can take up to several months in some cases.